Black Cat Music has built on 25 years of experience supplying music and performance equipment to the professional and education markets in UK and Ireland. Black Cat Music Europe has now been appointed Master Distributor for Wenger Corporation in Europe and Russia. 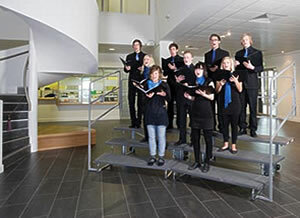 Black Cat Music Europe’s products range from the humble music stand to Full Stage Acoustic Concert Shells; including specialist music furniture, performance staging and Choral risers. Our web site and downloadable literature will tell you almost everything you need to know about our products and how they work. We stock literally thousands of music stands in European and UK warehouses and offer the same care and service to all our customers, including music schools, orchestras, choirs, theatres, schools/colleges and architects across the whole of Europe and Russia. For full details of territory boundaries, brand and product retail restrictions, please contact Black Cat Music Europe.